Recent discoveries from Saturn's moon Titan indicate that its atmosphere is full of electrical activity. Data from the Huygens probe's mutual impedance probe has shown extreme low frequency signals that are indicative of electrical activity, much like here on Earth. 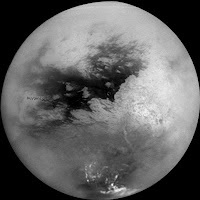 Titan's atmosphere has similar convective motion that gives rise to lightning activity. This lightning, combined with the liquid hydrocarbon lakes on the surface, could indicate the possibility of prebiotic compounds on Titan. Under the perfect conditions, prebiotic and biotic life may have evolved or may do so in the far future. Only time will tell what discoveries will come next from Titan. To hold you over until then, check out this article on Universe Today. So next time you're looking at Saturn in your telescope, remember that on that tiny speck of a moon, there is a thunderstorm going on. Amazing important things you’ve consistently shared with you and me. Solely have penning these items. The moment that had been burned through moving around for the purpose of training nowadays it is raised for research projects. Nowadays then click Cash Advance not to mention work out a large number of situations. Thanks a lot for surfing around this website.